Blake passed for 3073 yards and 28 touchdowns as a college senior in 1991 and led East Carolina to an 11-1 record. He was chosen in the sixth round of the ’92 NFL draft by the New York Jets and saw scant action in his first two seasons before being waived and moving on to the Bengals in 1994. When ineffective starting QB David Klingler suffered a knee sprain, Blake got his chance and was an immediate sensation. Smart, mobile, and with a quick release, he teamed well with wide receivers Carl Pickens and Darnay Scott on his long, high passes. His inexperience began to show as the season wore on, but he passed for 2154 yards and 14 TDs, against 9 interceptions, while topping the NFL with a 13.8 yards-per-catch average. Bengals went 7-9 to finish second in the AFC Central while leading the conference in touchdown passes (29). Blake had another strong season in 1996, passing for 3624 yards and 24 touchdowns, but was benched in favor of the returned veteran Boomer Esiason in ’97. Not a favorite of Head Coach Bruce Coslet, he was nearly traded after Neil O’Donnell won the starting job in the 1998 preseason and threw only 93 passes during the season. 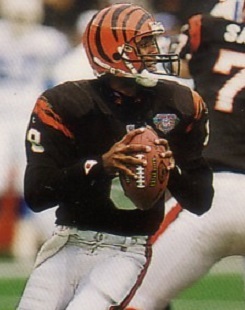 Blake returned to throw for 2670 yards and 16 TDs in ’99 and signed with New Orleans as a free agent in 2000. He got off to a good start with his new team, passing for 2025 yards and 13 TDs in the first 11 games before being sidelined with a broken foot. Aaron Brooks took over the starting job with favorable results and Blake was relegated to the bench in 2001. He moved on to the Ravens in ’02, where he started ten games, and Arizona in 2003 before finishing his career as a backup for the Eagles in 2004 and Bears in ’05. Overall, Blake threw for 21,711 yards and 134 touchdowns, with 15,134 of those yards and 93 TDs coming with Cincinnati. He also rushed for 2027 yards, 1499 with the Bengals. His Pro Bowl selection in 1995 was the only one of his career.